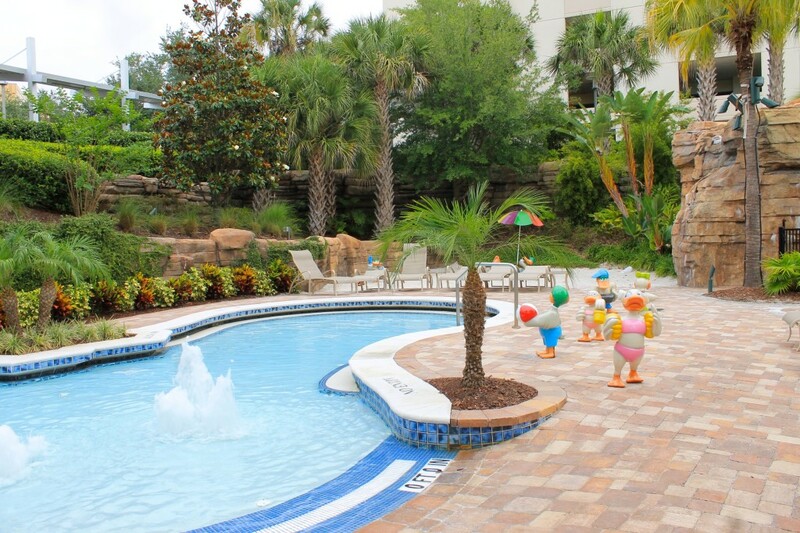 Located at the heart of Orlando’s International Drive the Hyatt Regency Orlando is close to Sea World and Aquatica and to countless restaurants and other attractions. While the location is ideal it’s the service and amenities that really set this Orlando hotel apart. From the moment we walked in we where greeted by friendly staff and everyone from the check-in counter to the restaurant was amazing with the kids, which I loved. The beautiful zero-entry Grotto Pool is perfect for families: surrounded by a lush and beautiful landscape it features a waterfall and a water slide, of which my kids could not get enough of. There where also lots of activities pool side from scavenger hunts and water games to fun crafts. The rooms where a good size, we had a suite with an adjacent 2 bed room and we thought that was the perfect setup for a family as we where able to enjoy watching some TV and even getting some work done on the comfortable desk once the kids where asleep. At first I though that the TVs in the bathroom mirrors where a bit much but we all enjoyed them. The kids would have brushed their teeth 5 times a day if I had let them and they just thought they where the coolest thing ever. We had a beautiful view and a wonderful night sleep, which is so important when you are on vacation. I really love the Hyatt Grand Beds®, they are some of the most comfortable beds I’ve ever slept on and I keep thinking I really need to get a mattress like that for my own bed at home! 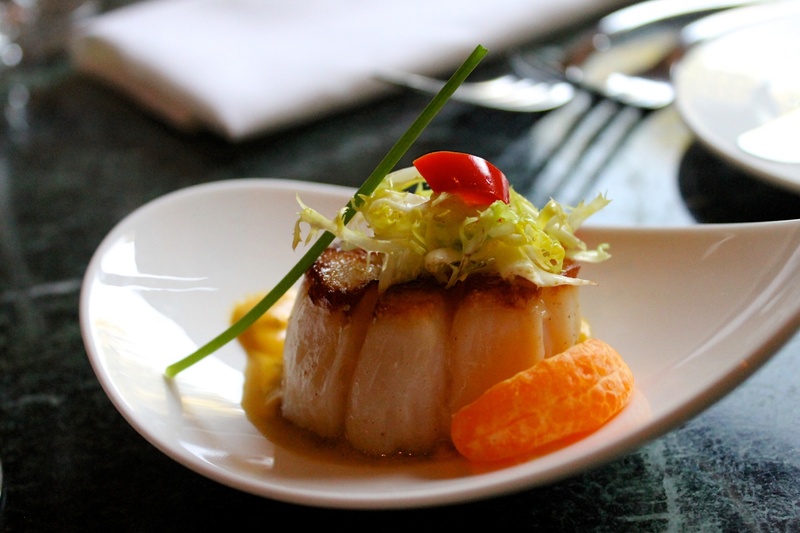 When it comes to dining you don’t have to leave the hotel as there are so many great options. Coconuts Poolside Bar & Grill features much more than hamburgers (which by the way where awesome!) with a menu that offers fun appetizers like ceviche and coconut shrimp and lots of healthy options like the veggie burger and the seafood salad club. Urban Tide features fresh seafood and local produce with a view of the Grotto Pool while the B-Line Dinner offers a casual diner atmosphere, a kid friendly menu including home made ice cream and is open 24hours. Fiorenzo’s Italian Steakhouse provides an elegant atmosphere while still being very family friendly and some of the best steak I’ve ever had! 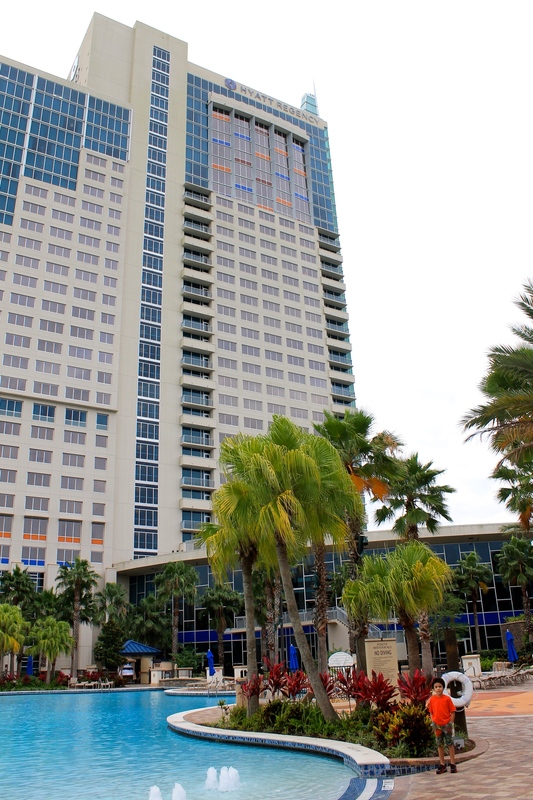 The location was ideal, close to restaurants and just minutes away from the new attractions and restaurants on I-Drive 360 including the Orlando Eye, the SeaLife Aquarium and Madame Tussards. There is so much to do to keep the kids entertained. While mom can relax the and sunbathe on the decks the kids will have an amazing time on the slide and taking part in all of the fun activities poolside: from crafts to scavenger hunts and water races. There is also a fun zero-entry pool for the the little ones! The food was fantastic. Our experience at Fiorenzo’s Italian Steakhouse was memorable combining amazing food and some of the friendlies and most knowledgeable servers who made us feel so comfortable and at ease. 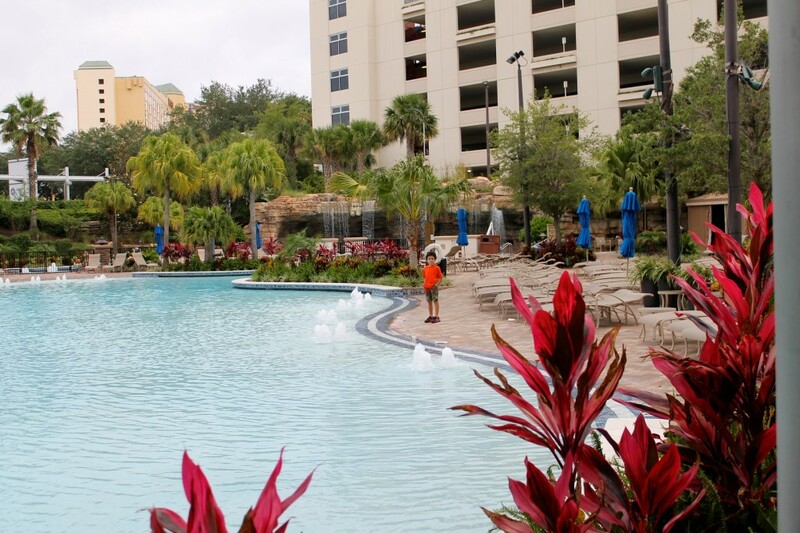 The Hyatt Regency Orlando’s Olympic-size Terrace Pool and state of the art fitness center give you enough opportunities to stay healthy and active during your vacation. I really liked that the terrace pool is completely separate form the grotto pool providing a tranquil environment to take a swim. I thought the hotel was a great value as we had all the fun and entertainment to make for an unforgettable family vacation. 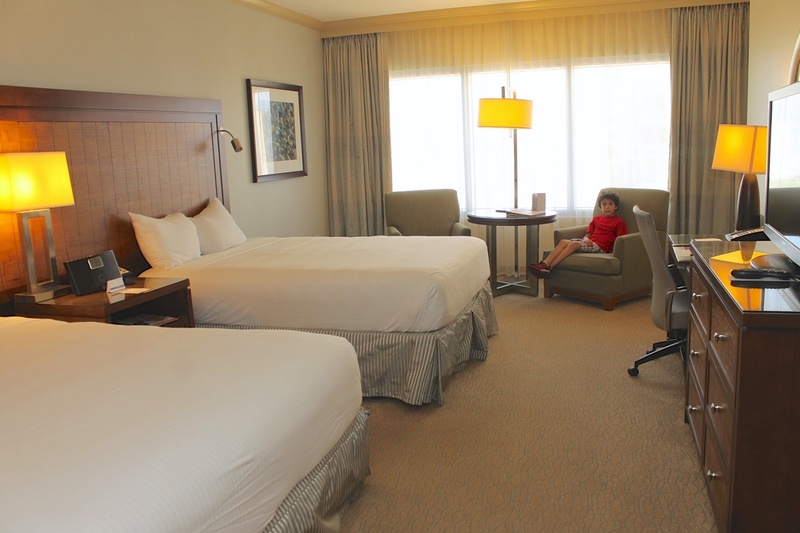 The rooms are spacious but if you are traveling with kids I would highly recommend getting a second guest room so you have some privacy once the kids have gone to bed. We had a suite that connected to a two bed room and we found it to be the perfect family setting. 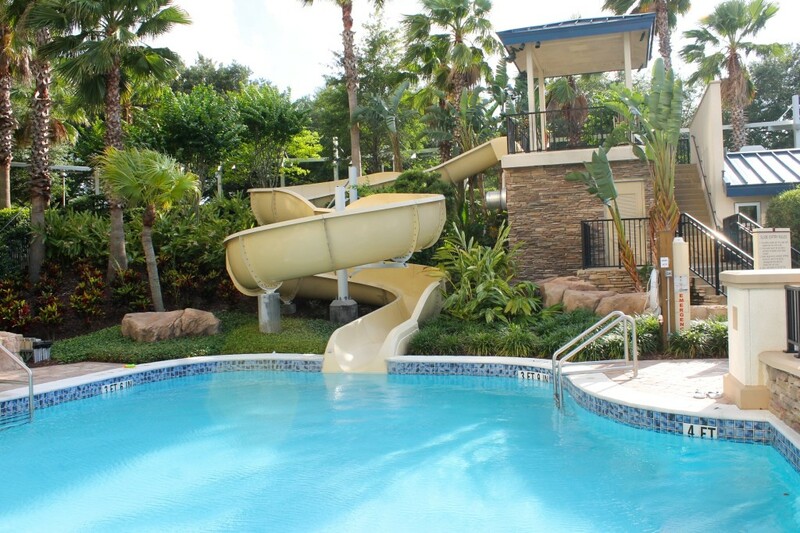 Right now with the Orlando Family Fun Hotel Package book one guest room and get a second room for the kids at 50% off, as low as $99 per night- and kids eat breakfast free in Urban Tide and you also get complimentary late check-out so you can enjoy the pool and slide! Check out this offer HERE. The hotel charges a $22 resort fee per room which will give you and your family access to the 24-hour Fitness Center, fitness classes, recreational activities at the Grotto and Terrace Pools, bike rental, 10% savings on spa and salon services at The Spa, two I-Ride Trolley tickets daily to explore the International Drive area, two bottled waters each day, and more, We thought it was a great value and the kids loved taking advantage of the fun poolside activities from scavenger hunts to water races. Self parking is $18 and valet parking is $27, which is comparable to valet parking fees in the area. If you are hitting the parks consider staying an extra day so you can enjoy the great pool and all of the kid’s activities, it’s a great place to spend a day relaxing and resting in between park visits and away from the crowds and the endless lines. 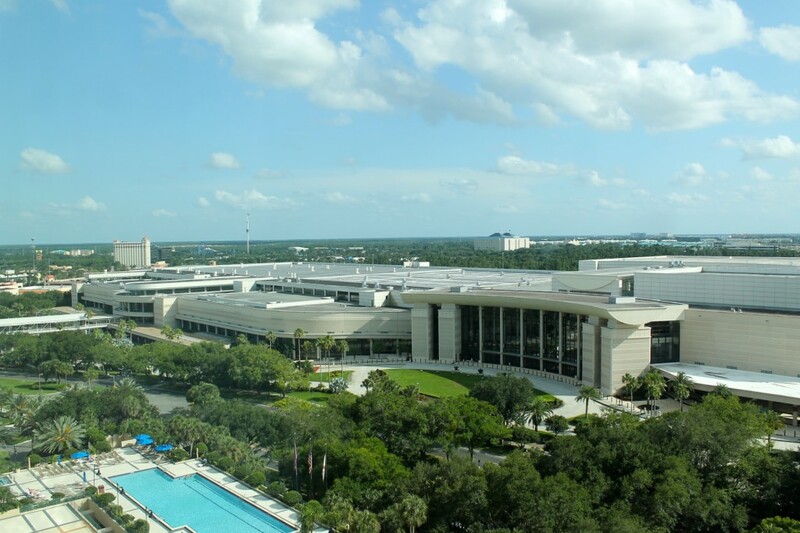 You can visit Hyatt Regency Orlando website for more information. Like them on Facebook and follow them on twitter @HyattOrlando to stay informed of new offers and events. My boys would have loved that waterslide. This location seems like it is very family-friendly. That is a very important consideration when one is planning a family getaway of this magnitude. We are in Orlando every year, but usually we stay on Disney property. This sounds like an awesome alternative. I haven’t stayed here but I love Hyatt brand hotels. They always have the best accommodations. I’d love to be spending some time outside that pool. What a gorgeous setup and the rooms are really pretty. This sounds like the perfect hotel for just relaxing–even if you have no kids with you! Yjose poo;s look inviting and I love that it is close by the other attractions that are offered in Orlando. What a pretty hotel. My kids would love the water slide and pool area best! Thank you for providing the great pictures! My kids would love to stay at a place like this. The water slide has me sold! I love resort style. . Has a lot to offer and plenty of fun.